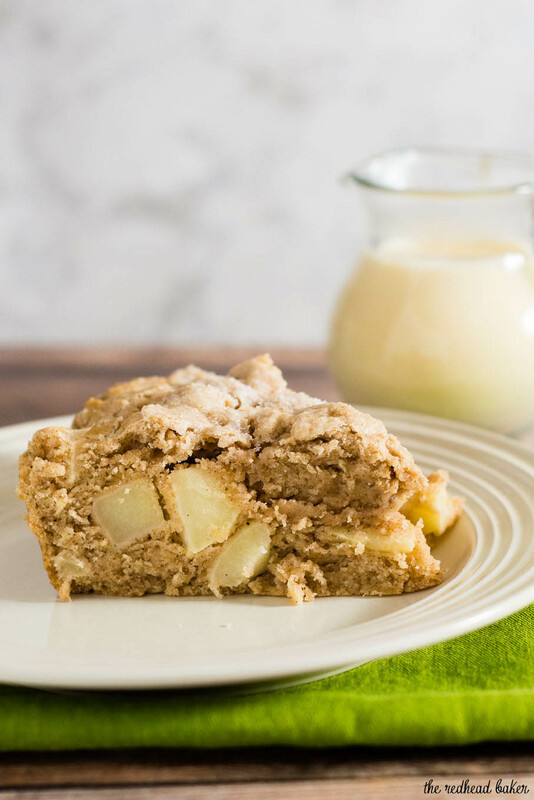 Irish apple cake has a scone-like texture and is studded with chopped apples. 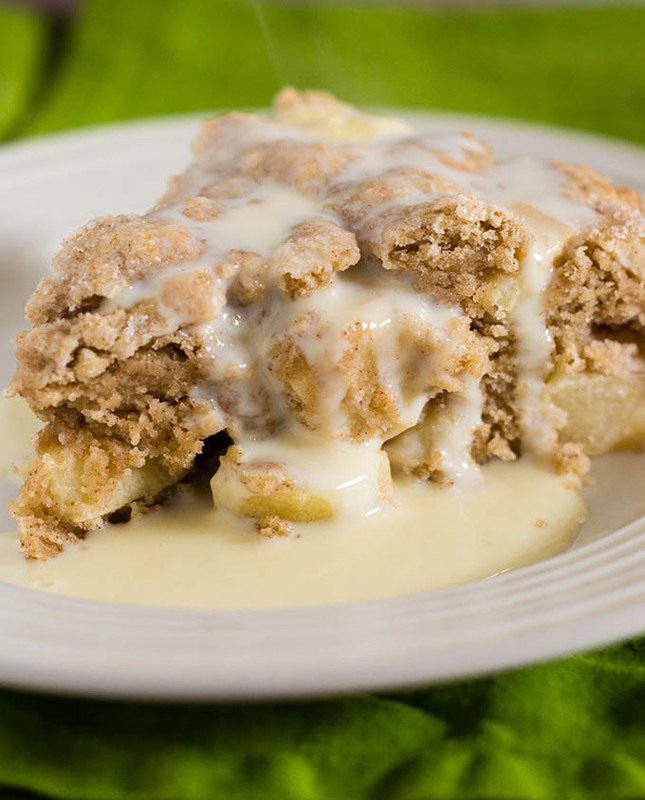 Serve with vanilla sauce for a delicious dessert. If you’re an American reader, when you think of dessert, you probably think sweet. Really sweet. High-ratio cakes with sugar-laden frosting. Pies with syrupy sweet filling. We’re pretty much the only country that eats dessert like that. The rest of the country does eat dessert, don’t get me wrong. But their desserts are much less sweet than ours. 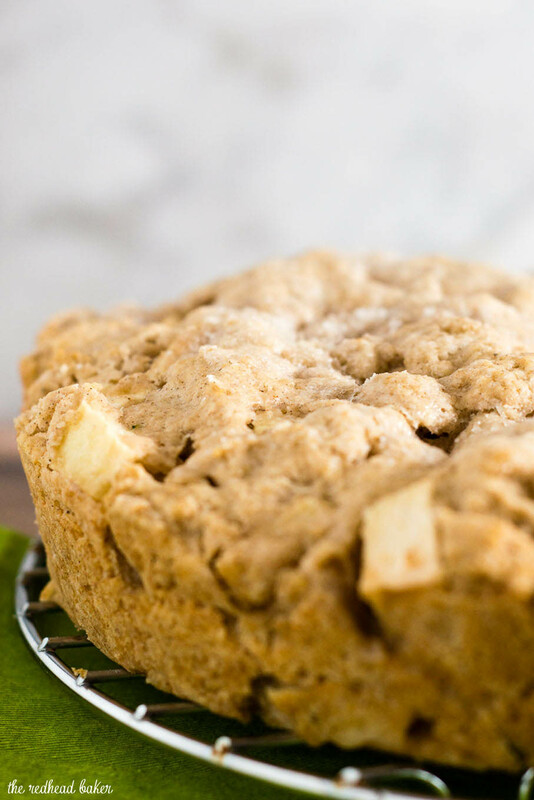 Take this Irish Apple Cake. It has more of a scone-like consistency. There’s only 3/4 of a cup of sugar in it! 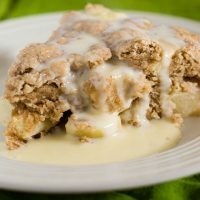 It gets additional natural sweetness from the apples, and a bit more if you choose to serve it with vanilla custard sauce or ice cream. The scone-like texture is achieve by “cutting” the butter into the flour. Unlike creaming together sugar and butter, where the butter and sugar are mixed at relatively high speed until they are creamy, cutting the flour in means to cut the butter into very small pieces until each one is coated in flour. This results in a flaky, crumbly baked good. There are tools for this sort of technique, called pastry cutters, and you can also do it with your fingers. Both are time-consuming. I prefer a much easier tool: a food processor. As with creaming in a stand mixer, you don’t want to over-cut the flour and butter. Just a few pulses should do it, depending on your volume of dough. You want short on-and-off pulses, not a steady running of the food processor. Similar to working with pie dough, you want to handle this cake batter as little as possible, so as not to overwork the flour and build too much gluten, which will result in a tough and chewy cake. 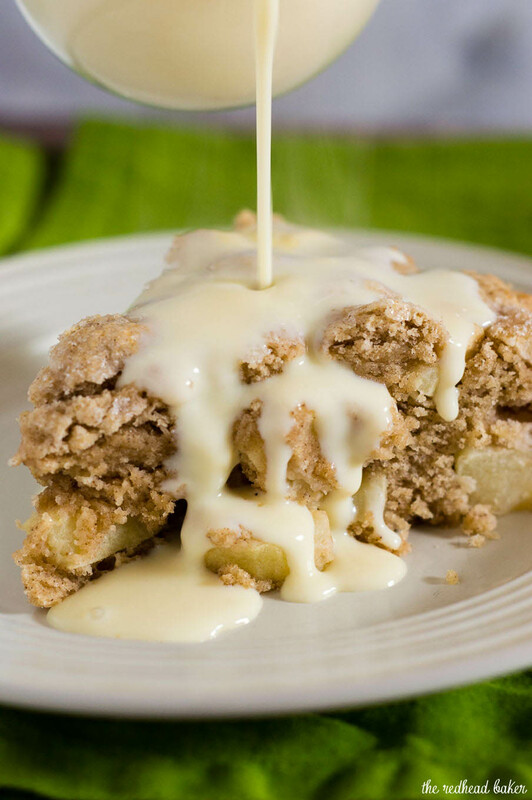 Once you add in the apple chunks, just give it a few folds with a spatula, get it into the cake pan and into the oven. This should be a rustic-looking cake. Finally, while you can enjoy this cake all on its own, there are a few ways you can garnish it: a dusting of powdered sugar would be nice. In this photo, I poured some creme anglaise (vanilla custard sauce) over a slice of the cake. You could also serve it with a dollop of whipped cream and/or a scoop of ice cream. Grease a 9-inch round cake pan with nonstick spray or butter. Preheat oven to 375 if using a light-colored pan, 325 if using dark colored pan. Place the flour, sugar, spices and salt in the bowl of a food processor. Pulse once or twice to combine. Cut the butter into chunks and add to the food processor. Pulse a few times, until the mixture resembles coarse crumbs. Transfer the mixture to a mixing bowl. In a measuring cup, whisk together the eggs, 1/4 cup of the cream, and the vanilla. Add to the flour mixture, and mix just until all the flour is moistened. Add the remaining cream only if needed. Add the apples to the batter, and fold in. Transfer the mixture to the prepared cake pan, and use moistened hands to smooth the surface. Bake for 45 to 50 minutes, until the cake is light brown on top and a toothpick inserted in the center comes out clean. Cool in the pan for 10 minutes, then remove the cake to a wire rack to cool completely. 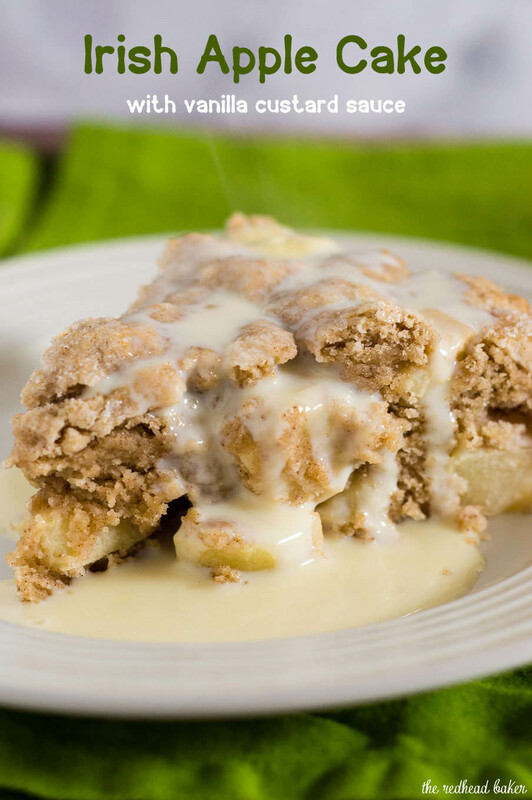 Serve with creme anglaise (vanilla custard sauce), whipped cream or ice cream.